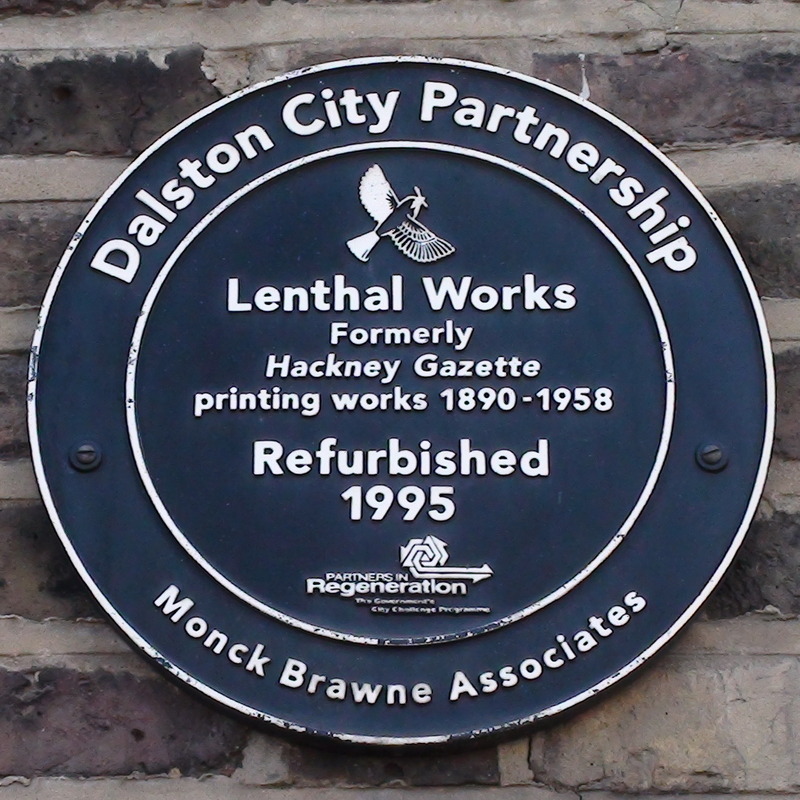 Lenthal Works, formerly Hackney Gazette printing works 1890 - 1958. Refurbished 1995. 2015: Anne Wilkinson points out that there is a Lenthall Road a few streets to the east. British History Online tells us that it was first developed in 1840 was called Grange Road until 1873. The London Screen Archive has a film of post-war housing in Hackney with a Lentall House. We are coming to the conclusion that Lenthall Works just borrowed a word that was already in use in the area. It would still be good to know where it originated. Our colleague Andrew Behan has done some digging in old Post Office Directories, from 1902 – 1983. This confirms that the plaque has misspelt “Lenthall”. 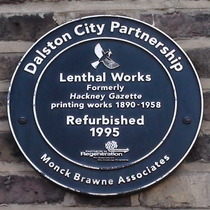 The actual entries are complicated but, in brief: Lenthall Works and/or Hackney & Kingsland Gazette and/or Potters Press are listed under the headings of Newspapers and/or Publisher and/or Printers and/or Stationers – Wholesale & Manufacturing at Richmond Road and/or 440 and/or 442 Kingsland Road. Other nearby addresses are also given for Potters. From all this we now think that Lentall Works was a printing and publishing company run by the Potter family and primarily involved in printing the newspaper. We can find no reference to this group at all but they existed in 1995. Sir Isaac Newton lived in a house on this site, 1710 - 1727.